Heat oven to 375°F. Make cookies as directed on pouch. Cool completely, at least 15 minutes. In food processor, process half of the cookies to fine crumbs. Remove and set aside; process remaining cookies to fine crumbs. Combine all of cookie crumb mixture in food processor. Add cream cheese and peanut butter. Process until well combined and can be pressed into a ball, 1 to 2 minutes. 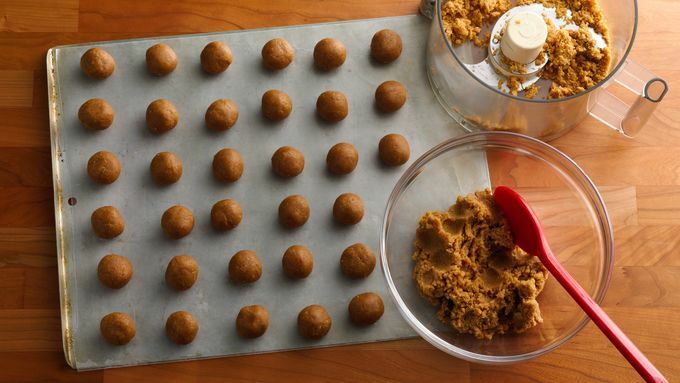 Shape into 48 (1 1/4-inch) balls; place on cookie sheet lined with waxed paper. Refrigerate 15 minutes. In medium bowl, microwave chocolate chips and shortening uncovered on High 60 to 90 seconds. Stir until smooth. 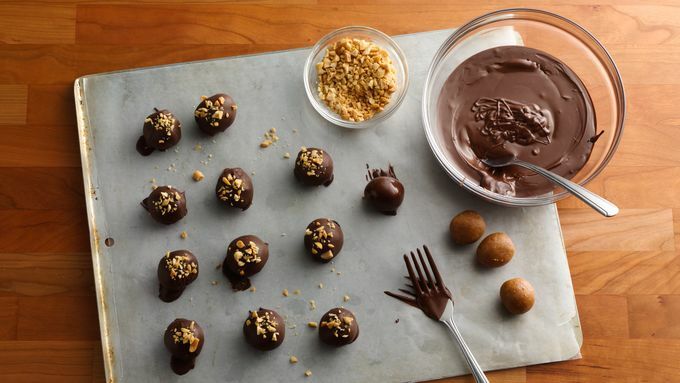 Using 2 forks, dip and roll chilled cookie balls, one at a time, into melted chocolate. Return to lined cookie sheet; immediately sprinkle top of each with chopped peanuts. If chocolate has cooled too much, reheat. Refrigerate truffles about 10 minutes or until coating is set. Store covered in refrigerator. For even easier dipping, take two plastic forks, cut out center two tines, and use to dip into melted chocolate. 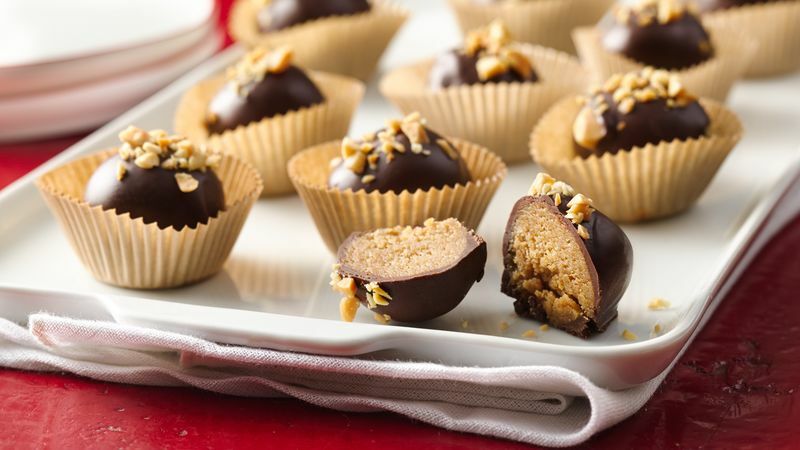 To make ahead, freeze truffles in airtight containers with waxed paper between layers. No food processor? Follow step 1 as written. Then place half of the cookies in 1-gallon resealable food-storage plastic bag. 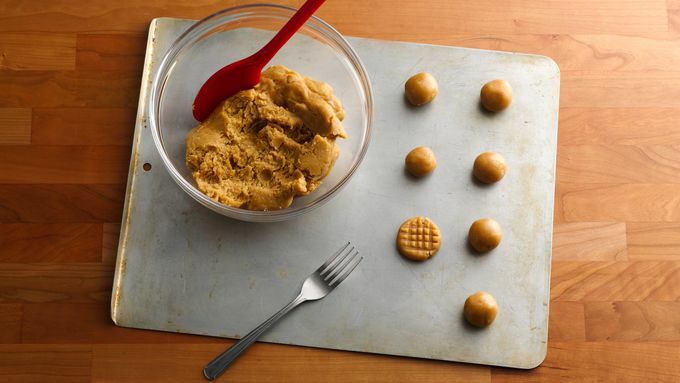 Seal bag; crush cookies with rolling pin to small crumbs, breaking up larger pieces with hands if necessary. Place crumbs in large bowl. Repeat to crush remaining cookies; add to crumbs in large bowl. Add cream cheese and peanut butter. Beat with electric mixer on low speed 1 to 2 minutes or until mixture is well combined, starts to come together and can be formed into balls. Continue as directed in recipe. If using 20% more cookie mix, add 2 tablespoons water to cookie mix, oil and egg.